You can survive the death of a child. I think this is one thing about which I still marvel. I thought Jason’s death would kill literally kill me. I didn’t think I could live without Jason. I didn’t want to live without my boy. I wanted to die. But, one breath at a time, one baby step at a time, one minute at a time, one hour at a time, one day at a time eventually became one month at a time. One month eventually became one season at a time. And here I am, ten years later – not exactly none-the-worse-for-wear, but here I am. I would give anything to have Jason here, to not have lived the past ten years without his precious presence in my life. I can’t go back, though, so I have to go forward. I am a survivor; I have survived the death of my precious son. I’m not the same person I was; I’m not as strong as I was. Hopefully I have learned some valuable lessons along the way and have become a more kind, caring and empathetic person. I want to live my life in a way that would make Jason proud of me; I am trying the best I can to live my life in a way that would make Jason proud of me. I will never “get over” the death of my child. I have not broken an arm; I haven’t caught the flu. I don’t need to “heal,” “move on,” “find closure.” “turn and face my grief” or whatever similar terminology others may feel a need to present to me concerning my grief and death of Jason. The loss will always be with me. Grief will be somewhere – perhaps sometimes not too far – underneath the surface for the rest of my life. The death of a child tears the very fabric of a parent’s life. It alters everything – hopes, dreams, future, present, faith, reality, relationships…the list could go on and on. I have had to learn how to live without Jason and integrate his loss into the very fabric of my being, and I will continue that process by varying degrees for the rest of my life. Integrating the death of a child into the fabric of one’s life takes much longer than anyone would think. Have you ever seen photos of people wandering around neighborhoods after a huge tornado or hurricane? They look lost, dazed, and in shock. They talk about not being able to locate any familiar landmarks; the landscape looks foreign. Everything they once possessed and knew as familiar is scattered to who-knows-where. That’s sort of what it’s like to lose a child. Jason’s death changed the entire landscape of my life and altered my whole world forever. I felt lost, dazed, and in shock. As a mental picture-aid, I tend to think of the death of a child as a wrecking ball smashing into a crystal vase, being tossed wounded into the middle of a category 5 hurricane, or a bomb blasting a huge crater. The vase is shattered into many pieces, some of them as small as dust. The pieces are scattered far and wide, and it takes a long time to find them and put them back into something that is functional and looks like a vase again. The bomb creates a huge vacuum and then a crater (made even larger by secondary losses and secondary wounds) and the surrounding landscape becomes totally changed. The thing about losing a child (using the vase/hurricane/bomb illustrations) is that I can’t just buy a new vase or move to another location. The unthinkable has happened – my child has died. Jason died. 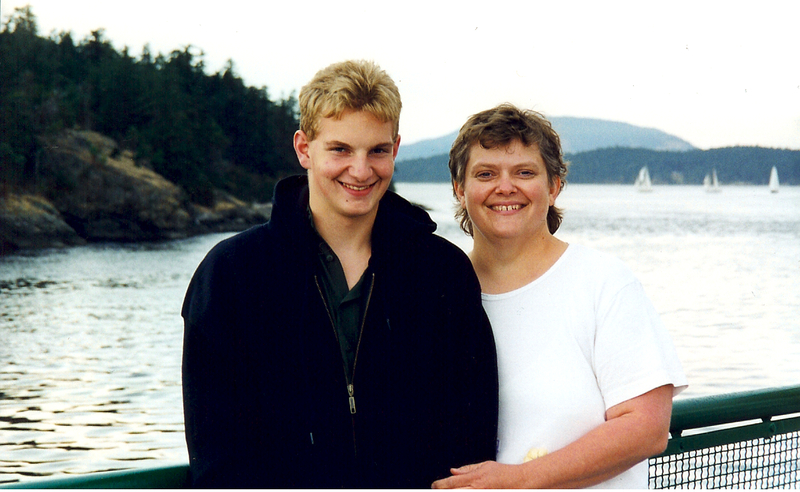 It’s my loss, my life, my family, my world – and I have had to figure out how to put things back together in a meaningful, useful way and how to live a purposeful life without my precious son. I have had to find original and/or replacement pieces and put that vase back together; it will never look the same as it once did. It may leak now and then or show the cracks. Hurting beyond measure (and not knowing how to swim), I have had to figure out how to keep my head above water in the midst of the storm and somehow make it back to solid ground. I have had to take whatever resources I had – sometimes only a spoon – and slowly start shoveling dirt back in the crater to try to create a productive landscape again. It has taken a lot of time and energy to integrate such a huge loss into my life, to begin to be comfortable in the skin of the person I now am, to find a “new normal” way of living without Jason. It’s a huge loss – one beyond anyone’s imagination. It took us however-many-years to reach the point we were in our lives when our child died. I was 26 when Jason was born and 46 when he died. I had looked forward to being a mother since I was young. That was my goal – I wanted to be a mother. When I was pregnant with Jason, I couldn’t wait to meet the active little person growing inside of me (believe me, he was very active!). The first time I looked at Jason after he was born, my heart felt so full of love for him I thought it would burst. He was my cuddler, my hugger, my sunshine. We wholly invest our lives and gave all of our love without reserve to our children. It’s not logical to think that the time frame for integrating such a huge loss into our lives will be short. It’s not logical to think that a bereaved parent can march through the “five step” grief process on a schedule. Many resources say that the second year may be harder than the first. The numbness has worn off, and the second year is when the a bereaved parent begins to deal with the permanent reality that s/he has to live the rest of his/her life without his/her precious child. I found this to be true for me. Some books will say that some, especially bereaved mothers, may continue to feel intense emotion and grief for 2-5 years. Grief can be complicated by many, many things – support or lack of support, individual griever (resources, personality, upbringing, etc. ), additional losses (moving, friendships/relationships, job, etc.). My own grief was complicated by many of these. If someone wants to look at a loose (and I mean very loose) time frame, I would say the following: There are no words to describe the pain of the first year; it’s like a limb has been torn off with no anesthetic. It’s excruciating, raw agony. Don’t expect the bereaved parent to be “over” the death of a child in the first year. The second year may be worse than the first as the bereaved parent grapples with the permanent reality of his/her child’s death. Any numbness has worn off – all that’s left is stark reality of having to live a life without his/her child. The years 2-5 involve the process and hard work of integrating the loss into the fabric of one’s daily life, of finding and becoming familiar with a “new normal,” of becoming familiar with the life that is now yours and the person you now are. It’s never a straight path; it’s windy, up and down, backward and forward. The years 6-10 are a continued integration of the loss and building on the foundation of the first five years. It’s a process that keeps continuing on and on. Perhaps if we – the bereaved parent and those around them – look at the grieving process in terms of years instead of days, weeks, or months, we would be able to remove unreasonable expectations and the pressure of a time limit, and be allowed to simply grieve the loss of our precious child in a more natural manner. Some bereaved parents struggle with their faith. I really struggled with my faith after Jason died; I didn’t understand why God didn’t protect Jason. I didn’t understand why “God’s people” were not there for us when we needed them so badly. I still don’t really understand. I prayed and prayed for our kids, for their protection, for their friends. There are just some things that we can only see through a glass darkly now and to which we will only know the answers once we get to heaven. The roots of my faith are deep and well-established. I know that, although my faith is alive, it does not look the same as it once did. People don’t know what to do or say to a bereaved parent. Sometimes people say or do nothing; they just back away or disappear. Sometimes they say things that, while meaning to be helpful, actually cause additional pain. When a bereaved parent’s heart is so raw, these secondary wounds tend to hurt much more than they would ordinarily and add additional layers of pain on top of an already terribly grieving heart. I found myself hypersensitive in many ways and deeply hurt by the actions/inactions of others. It hurt horrendously to be left so alone by people we counted on for support. It hurt even more to see my family so alone and hurting. It hurt to reach out for help, only to feel like my hand was slapped away. But I have learned over the years that I need to extend grace to people and let it go. I have to admit it took me a while to reach that point of being able and willing to extend grace because I was so hurt, raw and wounded. I continue to remind myself that it’s not an easy thing to be around a bereaved parent – or to know what to do or say. I feel like I have a lot of scar tissue on my heart from those experiences. I still tend to hunker down behind the walls I built as I tried to protect my broken heart from further wounds. I don’t believe in the same concept of friendship as I used to. But I will continue to try to extend grace to the best of my ability. I am far from perfect and don’t always succeed, but I will continue to try. We are all human and, though we try our best, make mistakes. I, myself, recently made a horrible gaffe in wishing a widower “Happy Valentine’s Day.” To me, Valentine’s Day is an opportunity to say to anyone – not just between couples – that I’m thinking of you and care about you. Although my intentions were good, I goofed up and caused hurt by saying the wrong thing. I was horrified when I realized what I had said and sincerely apologized. It was a good reminder to me personally (concerning people who disappeared after Jason died or said things to us that hurt) to continue to try to extend grace and forgiveness to others who may not have known what to say or do after Jason’s death. Most people will never understand deep grief…until it happens to them. No matter how often I have tried to explain or promote understanding, some people will never understand. Some have no interest. Some think they have it figured out…for me. Some relate it to the death of their relative, dog, or divorce. They don’t understand that the death of a child is singularly and profoundly the most difficult crisis a parent could face. Some try to understand or try to imagine what losing a child would be like, but unless someone has actually “been there,” it’s just imagination. Kindness, support, caring, hugs, love – all of these matter. Taking time to remember Jason matters. Writing down memories or sending pictures of Jason to us matters. Letting us know you haven’t forgotten Jason matters. Not feeling forgotten matters. I remember the kindnesses; I work hard at forgiving and forgiving the not-so-good things. If your address book empties, it’s my hope and prayer that new faithful friends bravely step forward to take the place of those who are no longer around. It’s also my hope and prayer that this blog will encourage people surrounding bereaved parents to step up to the plate when help, comfort, support, friendship, love, caring and kindness are so desperately needed. If you have initial and continued support from family and friends, you are blessed indeed. I am not the person I once was. The death of a child changes a parent forever. My life is divided into the “before” and “after.” The person I was “before” is not the same one who now is in the “after.” Neither I nor those around me should expect me to return to that person or to respond as I once did. Part of the grief process involves getting to know and becoming comfortable with the person I now am. Wherever I go, my grief goes with me. We sold our house and moved across the country, but the grief of Jason’s death and having his loss be a part of my life was not something I left behind. Running away from grief doesn’t work. Even if one is able to push it down or set it aside for a while, at some point it will rise to the surface and demand its due attention. Bereaved parents have to teach others how to help. As crazy as it may seem, even though we were dealing the huge loss created by Jason’s death, I found myself in the position of having to teach other people how to help us. It wasn’t an easy thing to do, especially when we didn’t know what we needed or how to help ourselves many times. I didn’t have any resources concerning being a parent whose child had died. I had no answers. I’m glad to see that there is much more valuable information now – both in print form and online – concerning how to help bereaved parents and those who suffer deep losses. 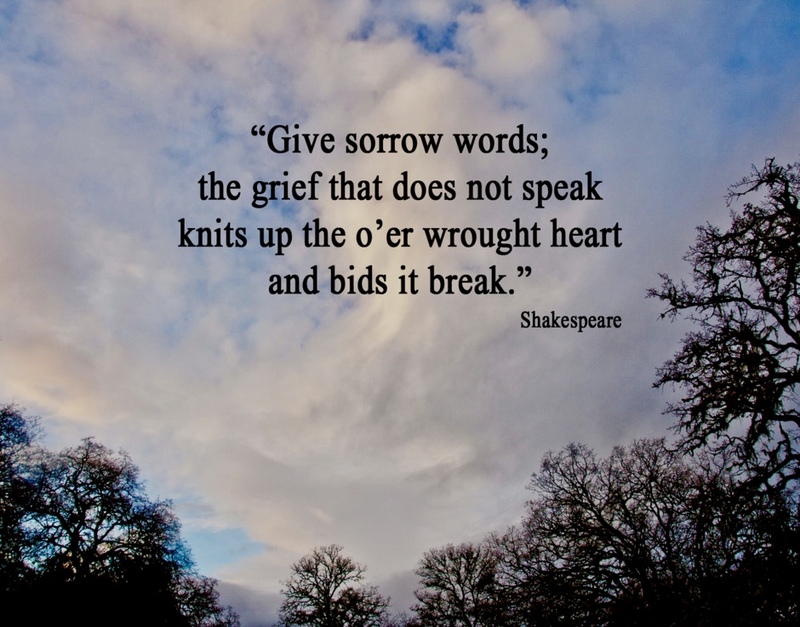 It’s important for bereaved parents to shine a light on the topic of grief. Take your time in going through and getting rid of your child’s things. I felt pushed to go through Jason’s room and “get rid of” stuff before I was ready. This is one thing I wish I had done differently – on my own time schedule, when I was ready. Suggestion: Unless there is an urgent need, don’t hurry or allow yourself to be pushed to get rid of your child’s things. Once you get rid of them, you usually can never get them back. If you rush, you may regret your decisions later. When you feel you are ready, purchase a bunch of Rubbermaid-type tubs that seal well and some Ziploc bags. As you sort, put things you want to keep or things you are unsure about into the bags and tubs. Then store the tubs in a garage or safe place. You can then go back later – perhaps even many years later – and make more objective decisions (decisions you won’t regret) on what to do with your child’s belongings. Exercise helps. Joe and I would take our dog, Brandy, and head out for a walk every so often. It got us out of the house and really helped us to get some exercise and fresh air. I am also so grateful for my friend Mary who, even though we didn’t really know each other well at the time, kept asking me if I wanted to walk regularly with her. I finally took her up on her offer six months after Jason died. Over time, we became good friends. She saved my life in more ways than one. Not only did our walks give me something to look forward to and a precious friendship, but (because I had developed the habit of taking very shallow breaths in order to deal with the pain and grief) it forced me to concentrate on my health and to force more air into my lungs.